Last week’s column discussed the vulnerability of the country’s food security owing to weaknesses in macroeconomic fundamentals. Imbalances in trade and large fiscal deficits undermine food security, especially of low-income households. Strong economic fundamentals, effective safety nets and increased agricultural production are needed to improve the country’s food security. Increasing food production is important in this threefold strategy to enhance food security. Healthy macroeconomic conditions are a prerequisite to ensuring food security, in a food deficit country such as Sri Lanka. A strong economy is vital to ensure that the country could import the basic food needs of those commodities that cannot be produced in the country or are inadequately produced. Strong external finances would enable the country to import the deficit in food production, as well as keep import prices low. Weak public finances and high trade deficits result in regressive taxation on basic food imports that reduce the capacity of low income households to access their basic food needs. The Government’s financial and administrative capacity to provide safety nets to those deprived of food needs for whatever reason is the second requirement for ensuring food security for all households. A strong economy and public finances would enable the country to provide safety nets for those whose incomes are too low to access their food needs. An efficient administration of a targeted food intervention programme will ensure that those who are really needy will receive benefits that guarantee their food security. Well targeted interventionist policies reduce the costs of such safety nets and ensure that the needy obtain the benefits. Although a large amount of public money is spent on poverty alleviation measures, these are badly targeted at present and many who deserve the benefits do not receive them. On the other hand, a large number of less deserving households get the benefit. This is self-evident from the fact that as much as 35 per cent of households receive Samurdhi benefits. Increasing food production is vital for improving food security. 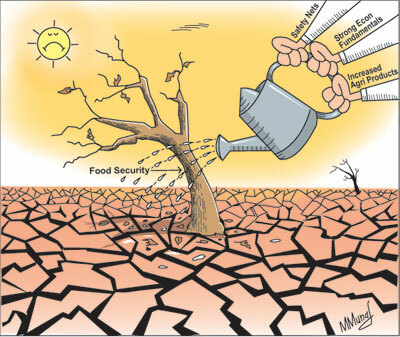 Although food security is not synonymous with food self-sufficiency, increased agricultural production reduces the vulnerability of the country to food insecurity due to external shocks such as high international prices caused by global food shortages, reduced export capacity and balance of payments difficulties. Increased agricultural production serves the food needs of rural households directly and reduces the extent of food insecurity in the country by increasing the supply and availability of food and by reducing food prices. A disappointing feature of the country’s economic growth is the slow agricultural growth and low productivity of most agricultural crops. The exceptions to this have been in rice and maize production and to some extent in vegetable production. Agricultural production has lagged below expectations due to many reasons. The enhancement of research capability, revamping of the agricultural extension system, improvements in marketing and development of rural infrastructure are preconditions for increasing agricultural production. One of the key pre-conditions for agricultural development is investment in research. The amount expended on research is grossly inadequate at a fraction of one percent of the value of agricultural output. Increases in yield can be achieved only if research develops high-yielding varieties adapted to soil and other climatic conditions. Without an effective extension service research expenditure is wasted and high levels of productivity cannot be achieved. Agricultural extension has been severely neglected over time and is now, for the most part, the responsibility of provinces. These have to be revamped to achieve significant increases in productivity. The current gap between the potential and actual yields is a measure of inadequate extension services, as well as an indicator of potential increases in agricultural production. The marketing of agricultural produce has been a perennial problem. At harvest time farmers are unable to sell their produce at remunerative prices that cover their costs of production. Prices of agricultural commodities are high at consumer levels, but often low at farm gate. The reduction of marketing margins could contribute much to both reducing consumer prices and farmers receiving better prices. Both these enhance food security. Farmer organisations to improve the bargaining powers of farmers; increased storage and milling capacities; development of refrigeration and canning facilities; and improving transport facilities are needed to benefit both farmers and consumers. The development of rural infrastructure by the repair and maintenance of rural roads, bridges and irrigation works are important determinants of productivity in agriculture. Poor infrastructure in rural areas is a severe constraint to farmers obtaining their inputs and for the marketing of their produce. Without these improvements in vital areas serving agriculture, yields will remain low, agricultural incomes depressed and rural poverty would persist. Although food self-sufficiency is not an attainable goal for Sri Lanka, as there are food items that we cannot grow in the country such as wheat and dhal, and there are others we produce very little, it is possible to increase production of many food crops whose increased production could improve food security. The most notable and important of such items is rice in which we are more or less self-sufficient in a good year. There is potential of increasing paddy production by increasing yields as the current yields of around 4.3 metric tons per hectare is much below the potential yields, particularly in the dry zone areas. If the correct cultivation practices are adopted, fertilizer applied in the correct proportions and good seed material are available, then yields could be enhanced significantly. An increase in rice production is needed not only to meet the immediate needs but also to have adequate stocks to meet short-falls in production in bad years of droughts and floods. Furthermore, increased rice production is needed to meet the demand for the increasing population of about 200,000 persons per year and to substitute rice for wheat. High prices for paddy are an effective incentive to adopt good cultivation practices, invest in required inputs and to cultivate lands that have not been cultivated. Increased incomes from higher production should help in reducing debt, increasing incomes of rural communities and reduce poverty that would improve food security. There should also be efforts to increase the production of other grains such as finger millet (kurakan), cowpea, soya, and local varieties of lentils. Such increases in production matched by a higher consumption of these are means by which the supply of food could be enhanced with advantage to the country. Such varied consumption would also improve nutrition. Increase consumption of easily available foods such as jak and breadfruit through an advocacy of consumption of these commodities would reduce food insecurity. There have already been such developments in response to price increases of wheat flour and bread. Such shifts in consumption should be promoted. The food needs of the country cannot be met by local production alone. Increased domestic production supplemented by an increase in export earnings from agricultural, industrial and services exports are needed to achieve food security. Therefore, it is vital that all sectors of the economy should develop rather than think narrowly about agricultural production alone meeting the food needs of the country. However increased food production is an important strategy to enhance food security. Enhancement of research capability, revamping of the extension system and improvements in marketing and rural infrastructure are needed to achieve higher productivity in agriculture to improve food security.